During the Middle Ages, entire months of the year were given over to special devotions. In 1883 Pope Leo XIII dedicated the month of October to the Queen of the Holy Rosary or Mary. With a busy 1,000–bed hospital and medical institute to oversee, the Carmelite priest keeps a close eye on the clock. After the celebration, he promptly closes the liturgy with a few words of wisdom. He also requests prayers for this year’s crop of students in the hospital’s nursing program who will take their final exams that afternoon. He then reminds the group that the day is the feast of Our Lady of the Immaculate Conception, to whom the Amala Hospital is dedicated. To celebrate, Father Paul encourages them to join a rosary procession that evening, which will begin at the chapel, wind through the institution’s rolling campus and end at the grotto near its edge, where he will hold a candlelit vigil. 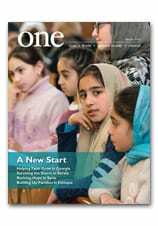 For more about Kerala’s health care system, check out the story, Healing Kerala’s Health Care in the current issue of ONE.